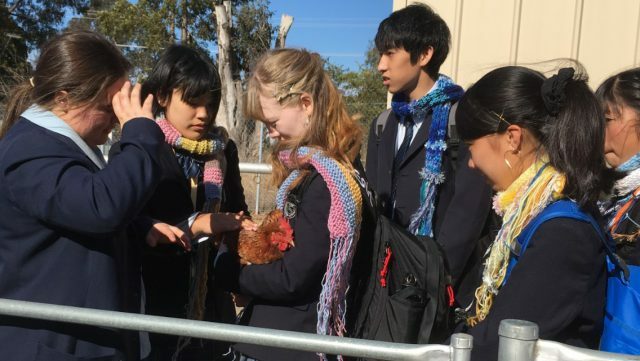 Trinity Catholic College, Goulburn recently hosted seven students from the Japanese City of Shibestsu which shares a sister-city relationship with Goulburn. The visit by Shibetsu High School students on Friday, August 31 began with a formal welcome from Trinity’s Principal, Mrs Gaye McManus to Shibetsu Shoun teacher, Fukuwawa Sensei and students Yui, Hono, Rina, Yuki, Toshimi, Yumeka and Runa. The visitors were then shown the banners around the school welcoming them to Trinity College before spending the day as Trinity students. First on the agenda was a senior Hospitality class led by Trinity’s chef, Mr Dane Sara, where they cooked a scrumptious zucchini and onion soup, and competed in a Vegemite and Milo tasting challenge! The cooking class was followed by an Agricultural class, organised by Mrs Rachel Smith. The College is renowned for its Agriculture Department and during this lesson, the students and Sensei were introduced to a range of local Goulburn stock, including Corriedale ewes, Poll Hereford heifers and Isa Brown hens. They also inspected our lupin, oats and soil nitrogen trial. Morning Tea was provided by the Animanga Club, Trinity’s Japanese cultural appreciation group. The students had a great time discussing, in a mixture of Japanese and English, topics such as JPop, Cosplay and manga. The visitors then played games and sports organised by PDHPE teacher, Mr Sam Treloar, who noted the excellent pitching arms of the Japanese students. This was followed by involvement in a junior Geography class, wherein the Trinity students talked about the Rainbow Serpent and the Shibetsu visitors reciprocated by showing us how to create origami cranes. As part of this lesson the junior Geography students welcomed the students and Sensei in Japanese and displayed the Fuji-san artworks they had created to honour our guests. The day’s final activity was the planting of a rosebush to commemorate the Shibetsu visit. Trinity Catholic College thanked their visitors for their enthusiastic participation and announced that they are hoping to send a number of students on the Council-sponsored trip to Japan in 2019.